Sorry for the lack of blogging and comments, and thank you to everyone who left a comment on my last post. I haven't been a good blogger lately and I apologise for my lack of commitment. I have been reading all your posts but haven't commented much recently. When things are busy (as they have been over the last few weeks) blogging unfortunately is the first thing to go. Whilst I love it and miss it when I'm not in the swing of it, I feel so guilty about using my time to browse and write blogs and not take care of jobs and chores. I did actually write 2 posts and then couldn't upload photos, then ran out of time and by the time I sorted out the photo problem the posts were out of date. Thanks to all of you who wished us luck with the dog training. I am pleased to report that there has been a significant improvement after just 3 weeks! Anyway, some of the many jobs I've been doing at home are curtain related, and here are my efforts. Poor Ruth has had a make-shift blind ever since she moved into this room (about 5 years ago! 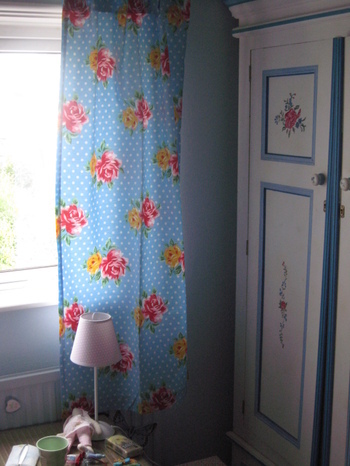 ), and I finally got round to putting up a curtain pole and hanging these Boden curtains that I got ages ago from eBay. They go perfectly with her wardrobe, and make her room much cosier. Unfortunately this is all I can show you as it is such a mess and we are currently at loggerheads over tidying, so rather than shock you all with the current stalemate I framed it very carefully so you can't see the floor! 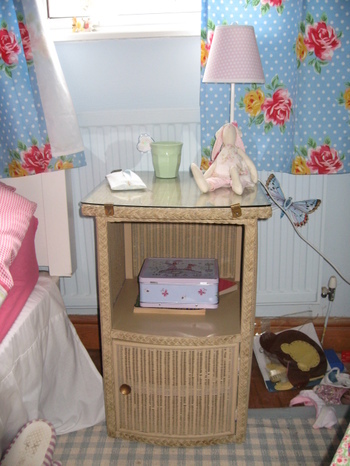 The bedside cabinet was a recent Freecycle find and I was going to paint it but Ruth likes it the way it is. 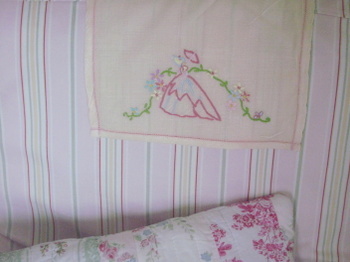 These curtains were a bargain find in an antiques shop in Hexham when I went to stay with my sister in the Summer. They were £2.50 and are perfect for the kitchen. 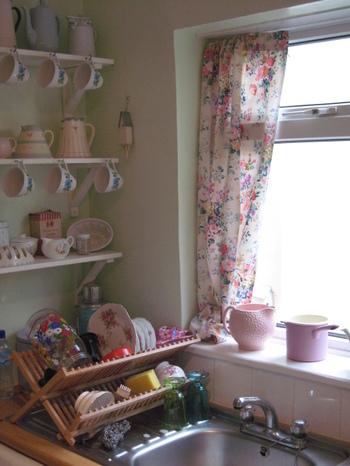 The draining board is full of bits and bobs I bought today and have just washed. The curtains were certainly more of a bargain thananything to be found in RE in Corbridge, which was an amazing place to visit, but the prices were a bit out of my range. It was very inspiring, and I could have comee home with pretty much everything they were selling had money been no object. They had masses of embroidered tablecloths for silly prices, unlike the PDSA shop in town, where I purchased this today for 99p. 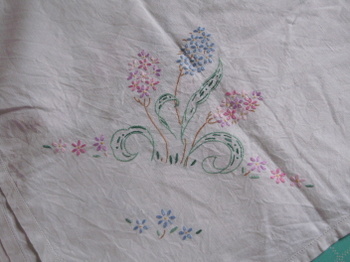 It is really crisp linen and has beautiful embroidery all over. This is just a little bit. I also got 6 of these napkins. And something which has really made my day. This little lot was a bargain but I would have paid 10 times more. I used to have a whole dinner service in this pattern, including serving dishes and gravy boat, all of which belonged to my Grandmother. 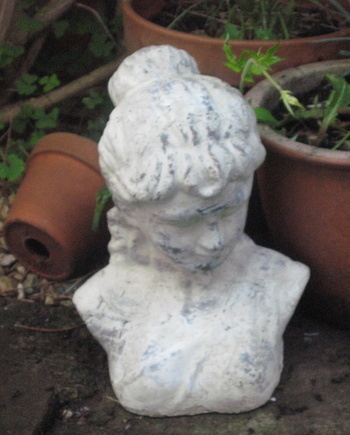 It was lovingly packed into a box when we moved house but it never made it to the new house. I thought it was in our basement with heaps of other unpacked stuff, but when we cleared the basement to have some work done there was no sign of the china. Although this was 7 years ago I still mourn the loss of it, and I have so far found 1 soup bowl to start my new collection. So you can imagine my joy when I found this set. 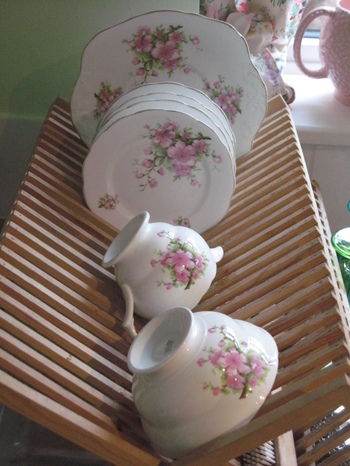 There are 4 tea plates, a cake plate and creamer and sugar basin. Not quite a complete dinner service, but a good start nonetheless. 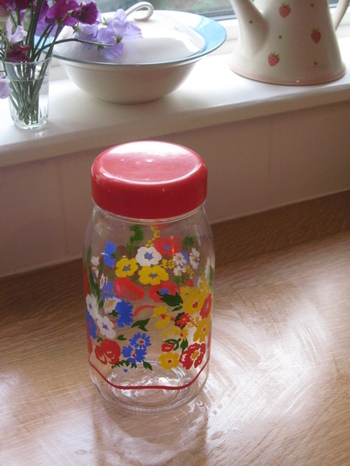 I also found this jar for 95p and I think it is going to hold my flour in the cupboard. Sorry for the photo quality - I'd just wiped the worktop! I am loving this Autumn weather we are finally having - blue skies and sun by day, and fires and blankets at night. Bliss. I had to treat myself to these Dahlias the other day too - they are just one of many reasons to love Autumn, and they go really well with my new oilcloth! I have also found time for a few sewing project. 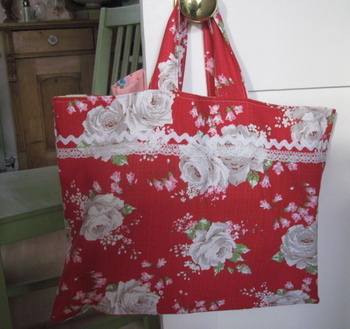 This is a bag to hold all my work stuff, and although it looks wonky is perfectly straight - it is just full already! 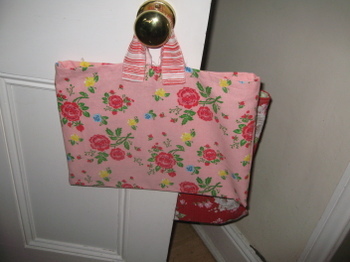 This is hanging on the other side of the door and is a bag for Grace's music - handy for piano and violin books. 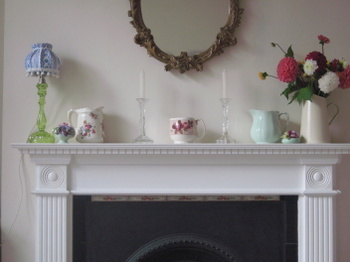 And finally, this is what I plumped for on the mantlepiece eventually. I am much happier with it now! Hope you are all having a lovely start to the week. I'll try to be a better blogger this week! PS I worked out what was wrong with the photos (as you can see). It was my new web browser, so this is done on my old one, and I am very proud that I figured it out for myself!! I just have to work out how to enable photo uploads on the new one now. Does anyone know how to get Typepad to let me upload photos and create links? I'm sure it's something I'm doing, but I can't work out how to fix it. It keeps coming up as html instead of the photo or link. It was working fine until last week but I can't get it going now. Any suggestions gratefully received as I have a post here ready and waiting but it is a bit boring and meaningless without photos! It may be raining outside, but I am in such a positive frame of mind at the moment that I am not letting it bother me. My life seems to be right where I want it just now, and am feeling relaxed and refreshed after the lovely summer holidays we had. I am doing just what I want to with my life, my girls are so animated and happy to be back at school, Andy is relaxed and happy too despite not having quite as much time off as the rest of us, and even Bodie is showing signs of calming down and chilling out! Poor Bodie didn't have the best start in life and when we got him at 7 months hadn't received any training at all. We did our best with him, and within a very short time had him behaving in just the way we wanted at home - sitting, waiting, giving a paw, even balancing a dog biscuit on his nose. Unfortunately, despite reading copious training books and trying to implement their ideas, bribing him with cheese and dog treats, and taking notes whilst watching 'Dog Borstal' (look it up - it's the funniest thing on tv even if you haven't got a dog! ), Bodie remains a real handful when we are out. He runs off after dogs, won't come back and pulls continuously on his lead. It got to the stage where I wasn't keen to take him out on my own, but all that is about to change! Last night we had a visit from an amazing lady called Claire, dog trainer extraordinaire. Even after one session I feel much more in control, and we have been practicing our homework ready for the dog training classes that we are all going to as a family. It sounds like really good fun, and I am really looking forward to it. Who knows - we may even enter Crufts next year!! Today I made a foray into town, and came back with some fab treasures. I haven't done much in the way of thrifting recently, and my favourite charity shop really came up trumps today. These little glasses were the first things I saw on my way in and (sadly) made my heart leap with joy. Some days I scour the charity shops for goodies only to come away empty handed, but today was definitely not one of those days. 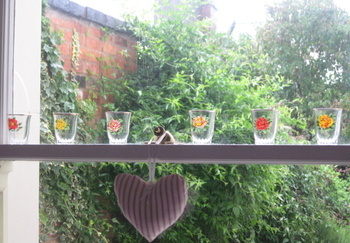 These have a picture of 6 different roses with the name underneath, and catch the light really nicely on the dining room window. 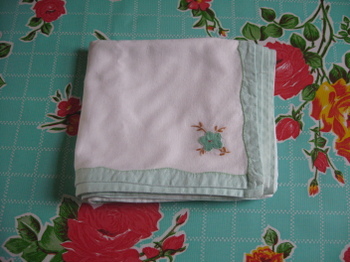 I love the colours on this crinoline lady tray cloth. 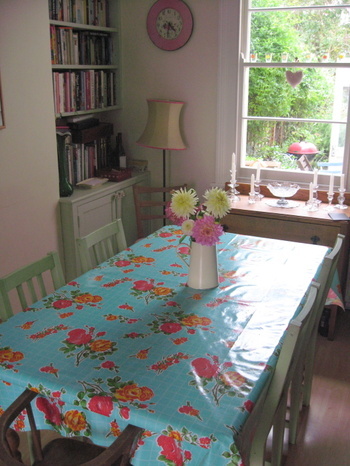 I have a project planned for this, and the tablecloth I bought today too that didn't come out well in the picture, but has lovely pictures of Hollyhocks embroidered in each corner. 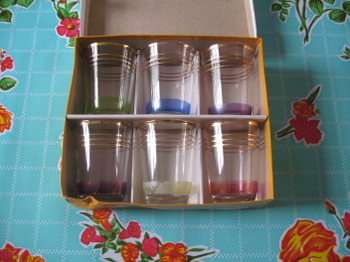 I love anything in the original box, and these glasses will come in handy for a warming whisky in the Winter. 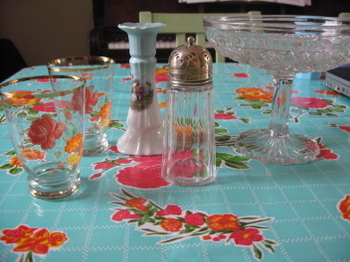 Some pretty glasses, a pale blue candlestick, a sugar shaker and a pretty glass bowl. 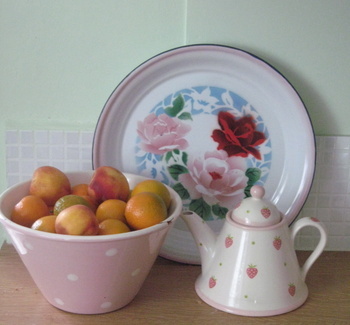 A pretty enamel tray for £1. Unfortunately I did the charity shop first, and ended up lugging several heavy bags around town, one of which contained the oblong mirror to the left of the picture above. Still, it was worth it, and I love getting home and unpacking my treasures, then carefully washing them in warm, soapy water, before placing them around the house. I spent a happy hour drawing round all these mirrors onto newspaper, cutting them out and then placing them with blu-tac. I then had to shorten all the chains before hanging them all. 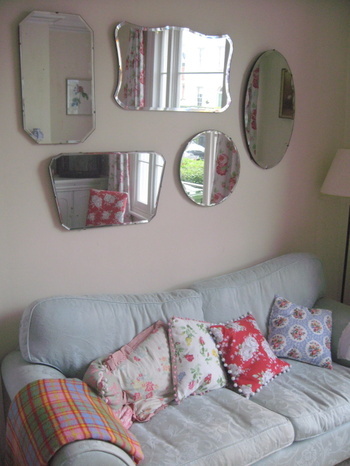 I had been waiting to get one more mirror so I could do this little project, and it has really made the sitting room brighter. I don't know if it is to do with the changing season, but I am really itching to rearrange my house a little. I love moving objects around and creating new groups of bits and bobs to look at. I did intend to do the whole of the downstairs today as Andy and the girls were quite happy with their own occupations and didn't really need my interference, but I spent so long doing the sitting room that I ran out of time. 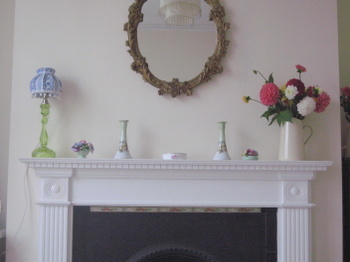 I had a creative block when it came to my mantelpiece and re-did it several times. I am still not entirely happy with it, but I am sure the inspiration will come to me (it usually happens in the middle of the night, so I could be floating around in the small hours moving candlesticks tonight!). We got some kindling today and we have coal left over from the Spring, so I may even light the fire tonight to cheer the place up. Attempt number 1 - too bland and boring. Attempt number 2 - not quite right, but better than 1. Attempt number 3 - better (despite dodgy photo), but still not perfect. 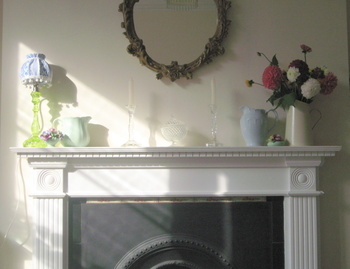 Amazingly the sun decided to shine for about 4 minutes while I took this picture, so you can't really see the candlesticks and the glass dish. I need a better central item, but am still in a quandry. I'll keep you posted! 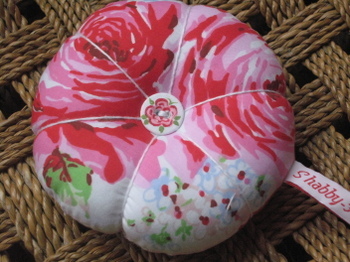 Before I go I must show you this beautiful pincushion that lovely Patricia sent me. She has the most inspiring blog, and makes really pretty things, so go and have a look for yourself. I hope you are all enjoying your weekend - the weather doesn't have to dampen the spirits, even if it does dampen everything else! ...Summer has been and gone. If you blinked you may have missed it. Tomorrow is back to school day for us all (except Andy, who has trotted off to work over the holidays leaving us asleep, or at best still in pyjamas!). I have mixed feelings about the girls going back to school - on the one hand I like the routine and order of the school week, but on the other I will miss them. I can't believe that I have children in Years 2 and 4 - where does the time go? Six weeks seemed like such a long time at the start of the holidays, and I now can't believe it has gone already. We've had such a lovely time, and our feet have barely touched the ground. We had the first week in Pembrokeshire (in glorious sunshine), then the girls went to my parents' house for a few days, then Andy had a week off and we pottered around here, then I went to stay with my sister and her boyfriend for a few days with the girls, then back to my parents again, then last week we went camping with our lovely friends Sophie and Greg and their girls. Phew, I'm exhausted, and need to go back to work for a rest! We had a fabulous time in Northumberland at my sister's new house. She lives in a lovely village near Gateshead, and we went to Tynemouth beach, into Newcastle, and to a fabulous museum called Seven Stories, which is a 7 storied building with each floor devoted to different themes in children's books. It was a really lovely place, and our favourite floor was the floor which explored the relationships in children's books set in the countryside with animals as the characters. It sounds very specific, but incorporated Winnie the Pooh, Wind in the Willows, Animals of Farthing Wood, plus many many more. If you are in the area I strongly recommend it - there was something for us all, not just the children, and it was really good fun. From Rachel's house we went to stay with my parents and spent a day on my Aunt and Uncle's canal barge. My uncle (who will forever more be called Cap'n Dave by us all) let the girls steer the boat, and I got to do the locks with my aunt. The girls definitely got the easy job! We had a lovely restful time and then came back to chaos and a pile of washing ready for camping a day later! View from the galley (kitchen to any landlubbers) window on the 'Rallus'. 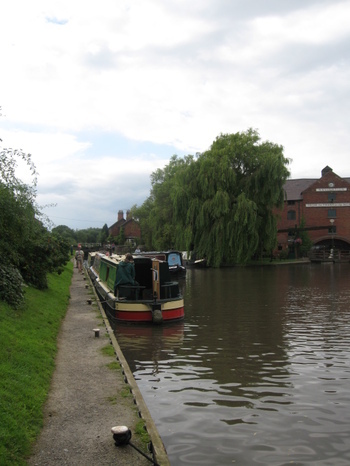 View from the front of the boat as we were just about to set off for a trip along the canal. The pace of life was just lovely, and people were so friendly. 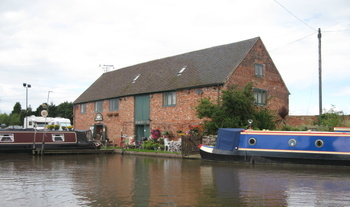 We got chatting to one family in a lock who had 8 month old twins in their car seats on the roof of their barge. They were having a ball watching all the leaves pass overhead. 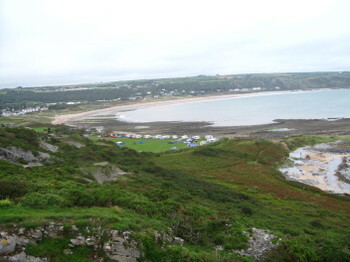 Last week we headed off to the Gower in Wales for a week's camping, and stayed at the best campsite I have ever been on. It was right by the sea and had amazing views (when the mist lifted - we were there 3 days before we saw past the headland!). 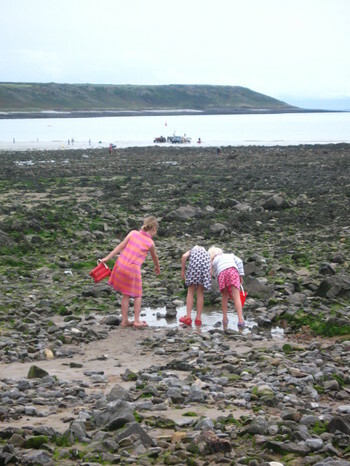 The girls all went off together to the beach and filled buckets with crabs and whelks - they spent hours bent double, peering into rock pools. We went to some lovely beaches, got cut off by the tide and had to wade through a river after climbing a sheer bank of trees with no path, then I jumped a ditch and fell in (which lightened the mood considerably) and had to squelch back to the car caked in mud. It was a real adventure and was actually quite exciting (in retrospect!). We went back to the tents for a shower and fish and chips, so a good end to the day. The girls did heaps of bike riding, crazy golf, and body-boarding and I swear they have grown several inches since the start of the hols. 3 of the 4 girls in a typical holiday pose - peering into pools! 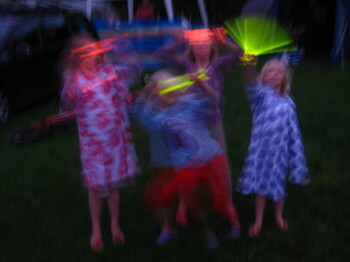 All 4 showing us their 'firework display' with the free glow-sticks that they were giving out at the camp shop. Our campsite from the headland. 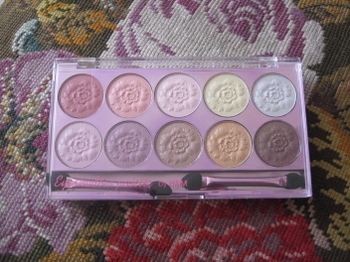 I couldn't not show you these bargains while I'm at it - the prettiest make up I have ever seen for the princely sum of 50p from H&M, and Delilah - the latest addition to the family, acquired for less than the price of a large glass of wine in my local! I hope if you are going back to school that it isn't too much of a struggle getting up in the mornings. My new term resolution is to have everything ready the night before, but I bet it lasts less than a week! I've got a huge joint of pork in the oven and am trying to have a chilled out evening with the girls before the chaos starts again!